Venus Express is mostly dead. The spacecraft spent more than eight years faithfully relaying information from the Morning Star/Evening Star planet, but it’s now out of fuel, out of control and within weeks of burning up in the atmosphere. While we mourn the end of the productive mission, the European Space Agency spacecraft showed us a lot about the planet that we once considered a twin to Earth. Some of the surprises, as you can see below, including a possibly slowing-down rotation, and the realization that volcanoes may still be active on the hellish planet. False color composite of a rainbow-like feature known as a ‘glory’, seen on Venus on 24 July 2011. The image is composed of three images at ultraviolet, visible, and near-infrared wavelengths from the Venus Monitoring Camera. The images were taken 10 seconds apart and, due to the motion of the spacecraft, do not overlap perfectly. The glory is 1200 km across, as seen from the spacecraft, 6000 km away. It’s the only glory ever seen on another planet. Credit: ESA/MPS/DLR/IDA. 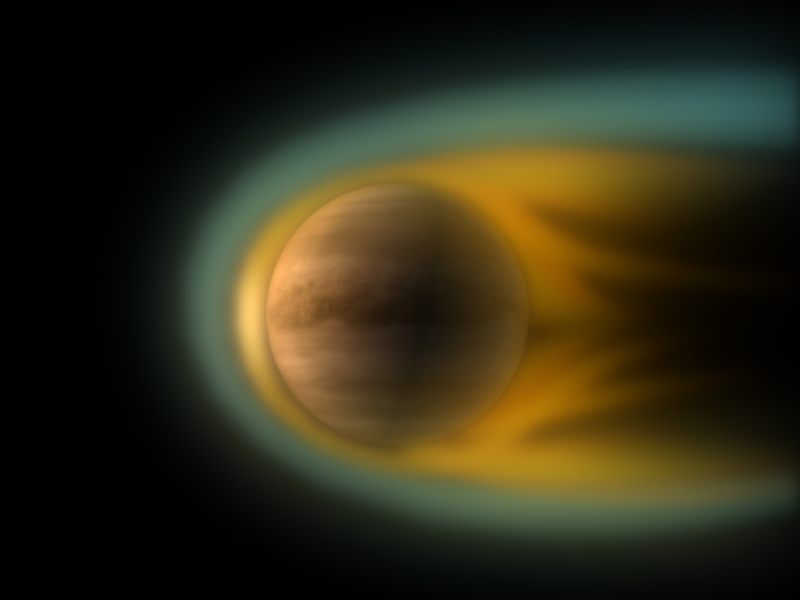 Quick video summary: Venus Express found that the spacecraft’s rotation may have slowed down by 6.5 minutes between 1996 (when the Magellan spacecraft was in orbit) and 2012. The surprising information emerged when scientists discovered surface features weren’t in the expected areas, and couldn’t find any calculation errors between the data. Quick video summary: Volcanic flows may still be active on Venus’ surface, according to 2010 data from the mission. Scientists looked at surface areas that had not been “weathered” very much (indicating that they are relatively young) and detected at least nine spots where the heat in those zones is much higher than the areas around it.